For more information and additional support resources, visithttp://developer.apple.com/programs/ios/. To report any bugs not mentioned in the “Notes and Known Issues” section, please use the Apple Bug Reporter on the Apple Developer website (http://developer.apple.com/bugreporter/). Additionally, you may discuss these issues and iOS SDK 6.1 in the Apple Developer Forums:http://devforums.apple.com. You can get more information about iCloud for Developers at http://developer.apple.com/icloud. 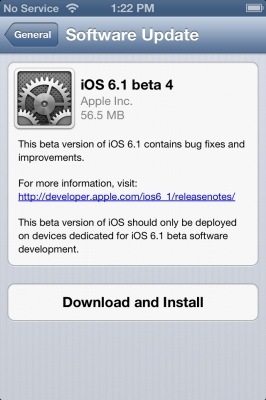 The following issues relate to using iOS SDK 6.1 beta 4 to develop code. Fixed: TVs and receivers that support only IT video format no longer allow RGB High to be selected in Settings > Audio & Video > HDMI Output. If such a TV or receiver was set to RGB High before this update, another value will be used instead. In iOS 6.0 and later, Core Image allows for the creation of CIImageobjects that reference OpenGL texture objects via theimageWithTexture:size:flipped:colorSpace: method. iOS 6.0 introduced a five-row Thai keyboard and removed the previous four-row keyboard. In iOS 6.1, both the five-row and the four-row Thai keyboards are available. Fixed: In iOS 6.0, push email does not work consistently with Exchange clients. This was usually related to moving between Wi-Fi and cellular networks. In iOS 6.1, the Map Kit framework introduces the MKLocalSearch,MKLocalSearchRequest, and MKLocalSearchResponse classes. Apps can use these classes to perform map-based searches for addresses and points of interest. The results are then delivered to the app as an array of map item objects. For information about these new classes, see Map Kit Framework Reference. Search results from these APIs may not be available in all areas or countries, including Russia and Japan. Fixed: This release does not support testing In-App Purchase in iOS Simulator. For apps that use this feature, please test on a device. NSString drawing additions and UILabel do not supportNSTextAlignmentJustified or NSTextAlignmentNatural text alignments. Instead, use NSAttributedString drawing additions, which do support text alignments. In iOS 6.0, when an app with a valid state restoration archive is starting up, a snapshot of the app is displayed instead of thedefault.png. In iOS 6.1, the snapshot is not displayed in this situation, because there are cases where the snapshot would not be appropriate. Instead, the default.png image is always displayed.